ATLANTA (AP) -- Japan honored former home run king Hank Aaron with one of its highest awards on Thursday, saying he is a symbol of its close relationship with the United States and their shared love of baseball. The Order of the Rising Sun, Gold Rays with Rosette was presented during a ceremony and reception at the home of Japan's consul general in Atlanta, Takashi Shinozuka. "It is an honor for Japan to have such a wonderful friend," Shinozuka said. 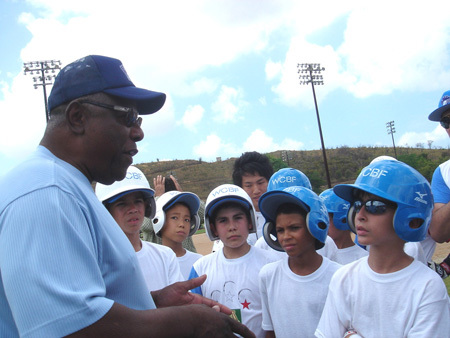 The 81-year-old Aaron was singled out for his long relationship with Japan's home run leader, Sadaharu Oh, and their efforts to bring young people together through the World Children Baseball's Fair, which recently celebrated its 25th anniversary. Oh was unable to travel to Atlanta, but the 75-year-old sent videotaped remarks. Aaron sat through most of the ceremony, next to his wife, Billye. He now must use a cane to get around after undergoing hip-replacement surgery. "The communication between the two countries is great," Aaron said. "Baseball has always played a pivotal role in whatever happens in everyday life." Aaron first met Oh shortly after breaking Babe Ruth's record for most career homers in 1974. Aaron went on to hit 755 homers in his career, a major league mark that has since been eclipsed by Barry Bonds. Oh, who played his entire career in Japan, has more homers than any professional player in baseball history, finishing with 868. Aaron and Oh are co-founders and honorary directors of the World Children's Baseball Fair, a weeklong event held each summer that brings together children from Japan, the U.S. and countries around the world for clinics and cultural exchanges. "For 25 years, we've been going back and forth trying to help young kids," Aaron said. "Not to make them home run hitters, but just to make them pen pals. By that, I mean someone that can write letters and be able to communicate with each other. The Japanese people have helped me out quite a bit. I want to thank them for all they do." Aaron's brother-in-law, U.S. Rep. David Scott, called the Hall of Famer a "God-blessed man and a God-sent man" who overcame racial prejudice to break one of the most hallowed records in sports and helped bring Atlanta together during the turbulent civil rights era of the 1960s. "Atlanta would not be Atlanta if not for Hank Aaron," said Scott, a Georgia Democrat. Coming out of the bitterness of World War II, baseball helped forge a tight bond between the U.S. and Japan, Scott added, calling that relationship particularly important in today's world, given the tensions with North Korea. "Baseball has kept our two nations together," the congressman said. Shinozuka pinned the medal to the lapel of Aaron's jacket, then played a 3-minute video made by Oh. "This makes me happier than if I had received the decoration myself," said Oh, who spoke in Japanese with English subtitles. Derek Schiller, an executive vice president for the Braves, toasted Aaron with a glass of sake. A longtime executive in the Braves front office, Aaron has played a largely ceremonial role with the team in recent years, though he has used his stature to push for more African-Americans in the game. He said he is pleased by the recent hiring of two minority managers, former teammate Dusty Baker by the Washington Nationals and Dave Roberts by the Los Angeles Dodgers. After the toast by Schiller, Aaron took a small sip of sake and smiled. "You're forever an Atlanta Brave," Schiller said. "We're very proud of that, everything you mean for us. You're our hero. You're our champion."